Australian Army soldiers Trooper Chris Perks (left) and Trooper Sam Menzies with a PD-100 Black Hornet Nano unmanned aircraft vehicle during training exercise at Shoalwater Bay Training Area, Queensland. Image via Commonwealth of Australia, Department of Defence. 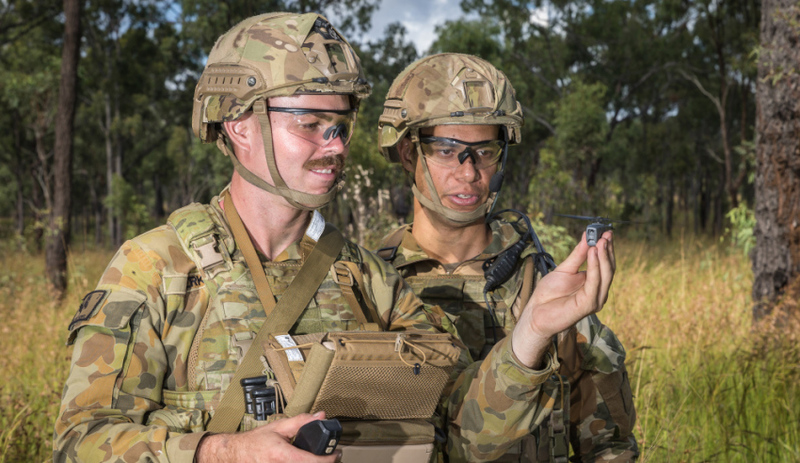 Following the completion of the Black Hornet Nano UAS program, unmanned aerial systems will soon be rolled out to Australian Army soldiers in Brisbane. Commander of the 6th Brigade and the Army’s only UAS unit, the 20th Surveillance Target Acquisition Regiment, Brigadier Susan Coyle said that the Black Hornet Nano UAS rollout was a significant achievement for the Army. “UAS are a game-changer for the Army, providing enhanced situational awareness for better mission execution for Australian soldiers,” BRIG Coyle said. The Australian Army is the largest operator of UAS in the country and is one of the largest users of Nano UAS across the globe. “The Australian Army is now the biggest user of Nano UAS in the world. It is also the first in the world to proliferate this technology to the conventional forces down to combat platoon level,” BRIG Coyle said. “Experience of UAS operations overseas and in Australia have provided [the] Army with unique expertise that is in high demand. The Army operates several UAS, ranging from the nano-sized reconnaissance Black Hornet to large, nine-hour endurance surveillance systems such as the Shadow 200.